A quickly approaching government mandate on electronic logging devices (ELDs) is coming to a head in December, but instead of dreading the red tape, trucking companies should be strategizing on how it can give them some extra green. By Dec. 18, the majority of heavy-duty commercial trucking operations that haul between state lines must log their hours using ELDs to stay in compliance with new regulations from the U.S. Federal Motor Carrier Safety Administration (FMCSA). With around 2.65 million motor carriers and 230,000 commercial buses in operation today, this new rule will have a wide-reaching effects on the entire ground transportation industry. This may sound like just one more process standing between trucking companies and their main goal — getting their drivers, fleet and cargo where they are going safely and on time. But this couldn’t be further from the truth. This change is actually a huge boon for carriers. By switching to an automatic, telematics-based solution, the FMCSA is actually offering trucking companies a way to sidestep what is an arduous process, improve operations and cut costs. Commercial vehicles that are in operation for long hours have to log hours of service (HOS). Because this has been a manual paper process, trucking companies without an automated ELD solution often spend inordinate amounts of time filling out forms rather than focusing on their business. But ELDs automatically track not only HOS but many other helpful parameters, like engine use, road speed, miles driven and timestamps, unlike past electronic monitoring solutions like automatic onboard recording devices (AOBRDs). These added features are why ELDs lead to faster and simpler auditing, easier scheduling and dispatch, and reduced fuel and equipment costs. Also, should anyone legally challenge a trucking company, these carriers now have highly defensible HOS data that could help them steer clear of expensive fines. So now, not only do trucking companies have a way to avoid fines, they have a solution that can provide them cost savings across nearly every step of their daily responsibilities. But companies looking to gain the most benefits from ELDs can’t just select one at whim. Carriers can’t assume every product will work exactly the same. They must choose a trusted name in telematics or face challenging technological and safety issues. Carriers must also be careful when trying to tap into their ELDs via Bluetooth. Some ELD manufacturers limit the number of connections carriers can make with one device, which can lead to logistics issues. Additionally, some of these devices lose connectivity when the vehicle loses power. This means companies could still potentially incur those expensive fines if their ELD doesn’t have a backup connection option. These devices also need data safety and security built in from the ground up. There has been a 458 percent increase in connected device vulnerability scans in the last two years, according to a recent report by AT&T. So while that study also proves that road-based Internet of Things devices drive down insurance costs and increase safety, it is critical to secure the data at all connection points. 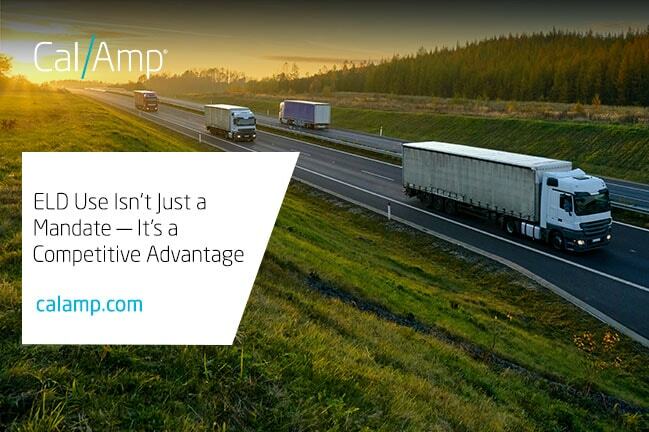 Automatic logging through ELDs, when done with a trusted telematics solutions provider, can lead to automatic compliance, fast and easy HOS logging, and a slew of other cost and energy savings. For example, our V-Series can be self-installed and features a removable tablet, custom designed cradle with embedded telematics and a programmable LED malfunction indicator. With an all-in-one solution there are fewer points of failure and it allows carriers to rapidly deploy an ELD compliant solution for both light and heavy duty fleets through one reliable supplier.